Tue, Apr 23, 2019, 2:55:43 ---- The fact: 42.844.000 visitors done. Tubeman meets ZZ Top T-Drill Industries Inc.
Mark Sanders, Sales Manager of T-DRILL Industries Inc, is also a Roadster hobbyist. This time Mark attended to the 40th annual Roadster Show in Pomona CA, USA. The show takes place every Fathers day. 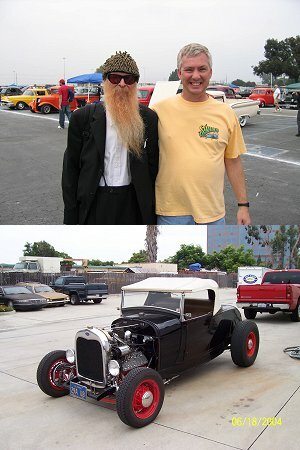 In the Show he met many Roadster enthusiastics including Billy F. Gibbons, frontman for the acclaimed Texas trio ZZ Top. T-DRILL is manufacturer and worldwide supplier of Tube and Pipe Fabrication Machines.